This BioProvince (as defined by Armen Takhtajan) comprises the Greater Antilles (Cuba, Jamaica, Hispanola and Puerto Rico), the Lesser Antilles (including Anguilla, Antigua, Aruba, Barbados, Bonaire, Curacao, Dominica, Grenado, Guadeloupe, Montserrate, Nevis, St Kitts, St Lucia, St Vincent, Tobago and Trinidad), the Bahamas, Bermuda and the southern tropical part of the Florida Peninsula. The geology is complex and varied while the climate is typically tropical but rainfall varies with elevation and is affected by water currents. Cool upwellings keep some islands (Netherlands Antilles) arid. Also the warm, moist tradewinds blow consistently from the east creating rainforest-semidesert divisions on mountainous islands. The flora is extremely rich with some 200 endemic genera, and on Cuba alone there are about 6000 species, 47% of which are endemic, although over half of these are confined to the island’s serpentine soils. Some of the more widespread endemic genera include Auerodendron (Rhamnaceae), Bonania (Euphorbiaceae), Grimmeodendron (Euphorbiaceae), Lasiocroton (Euphorbiaceae), Leptocereus (Cactaceae), Nashia (Verbenaceae), Neobracea (Apocynaceae), Neothymopsis (Asteraceae), Phialanthus (Rubiaceae), Picrodendron (Euphorbiaceae), Pseudocarpidium (Lamiaceae), Sachsia (Asteraceae), Spathelia (Rutaceae), Tetranthus (Asteraceae) and Triopteris (Malpighiaceae). Many other genera are confined to particular islands such as the Jamaican endemics Jacaima and Jacmaia, which are commemorative anagrams of ‘Jamiaca’. A particular interesting species on Cuba is the ancient, endemic cycad Microcycas calocoma (Zamiaceae). It is considered to be the World’s oldest ‘living fossil’ with a lineage that stretches back to the Palaeozoic period some 250 million years (see limestone scrub forest). 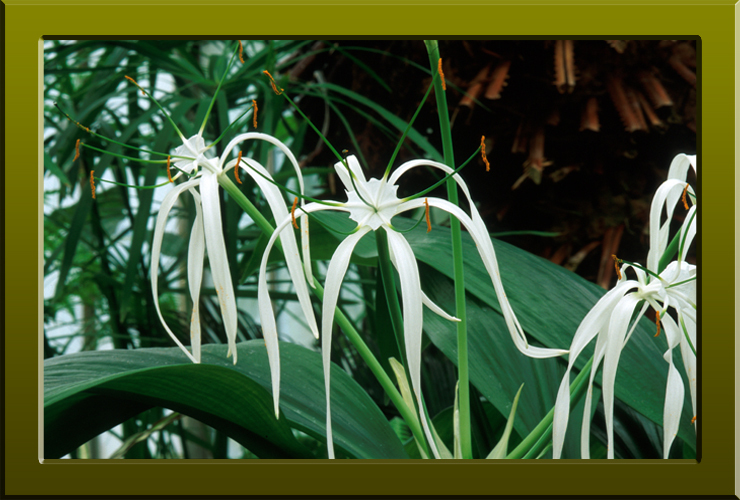 Hymenocallis caribaea (Alliaceae) commonly known as the spider lily this species is a Caribbean endemic (Copyright © 2010 Peter Martin Rhind).